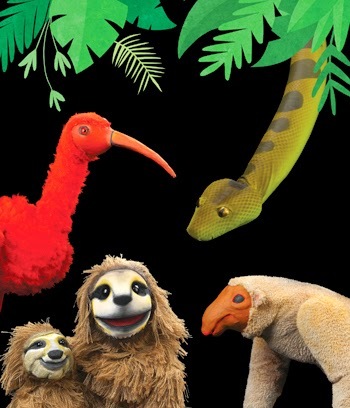 Prepare for a wild adventure beneath the Brazilian tree tops with toucans, anteaters, poison frogs, and more! It's a jungle out there in this entertaining and enlightening peek at the amazing Amazonian rainforest! Experience a day in the life of more than 30 exotic animals that live in this vital ecosystem. A mischievous howler monkey leaps from tree to tree, a keen-eyed harpy eagle searches for its next meal, and pink river dolphins playfully peruse the waterways as the jungle comes to life in this vibrant escape to the tropics. Tickets include Performance, Museum entry, and the Create-A-Puppet Workshop where patrons can make their own Electric Eel Ultraviolet Puppet to take home!